Buddhism in Laos, the land of million elephants, was gradually declined since the colonization of Siam (Thailand) and France to Laos over 100 years. And up until when the Buddhist Scholars Council was established in 1928 by the group of intellectual, led Prince Petcharaj, which it was regarded as the starting point to restore and strengthen the foundation of wisdom of Laos society as well as the needs of Laos Independence from France. Meanwhile, the support from Buddhism side in that time, monks and novices were given chances to study dhamma and Pali language, one of the monk was Venerable Maha Pan Anandho whom studied Buddhism until he graduated to level 6 and he realized that the core of teaching is to apply the teaching principles into practice. This realization is a turning point that affected his life. Later, he was acting as the Great Master to restore Buddhism in Laos especially to restore the guidelines of strong meditation practice foundation. Moreover, there is a vast expansion of meditation centers throughout Laos up until now. 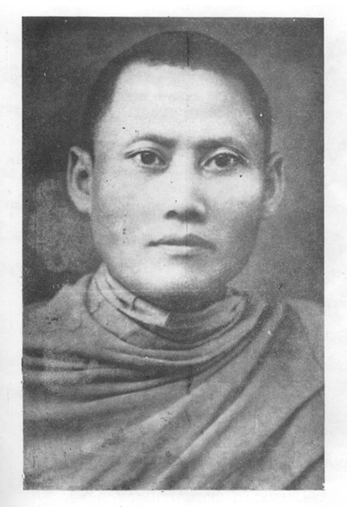 Maha Pan had gained meditation guidelines from Mahathat Yuwarangsalit Monastery in 1952 which was in the time of dhamma education had been promoted by Venerable Pimondham (Ard Aasago) and the group of monks from Burma were invited to help setting up the foundation of abhidham and meditation practices. Later in Laos, this practice is called ?motion ? still? which its core based on Satitbhatdhan. Moreover, it was regarded as an effective method and is expanded extensively throughout Laos and Thailand by Venerable Thien Jittasupo, great master monk whom had studied and practiced with Venerable Maha Pan in Nongkai province which affect his life and be able apply as a practice guidelines. The work of Venerable Maha Pan is quite extensive in every aspects. Over 11 years between 1957-1968, he set up Maha Bhuddavongsa Pa Luang Monastery or Sok Pa Luang Monastery in Vientiene province as a meditation center for any laypersons whom are interested in dhamma study and practice. He was committed and quite strict to his teaching to the students which included monks, novices and nuns, to be able to study and practice dhamma continuously. Meanwhile, dhamma preaching and dhamma talks were set up every Sundays in order to give chance to students to learn from each other. Moreover, for those whom had good potential were also promoted to study Aboard and later came back to work as Buddhist leaders and help setting up 20 meditation centers throughout Laos. As well as, he also focused on training young generation, the ?Buddhist Youth? Moral Training Centers were set up in 5 schools around the capital city. From here, there were some youth came to study and practice dhamma and help spreading out dhamma as well. In addition, bi-monthly magazine called ?Buddhavong?, have been published for 9 years, which was regarded as a forum for any intellectual and dhamma communication to be disseminated. On the other hand, all the key supporters and activists of the movement were driven by the group of former scholars from Buddhist Graduates Council in Chantaburi, was closed earlier due to the political movement. It was quite sad that Venerable Maha Pan had died at the age of 58 in 1968 which it was the same time that Laos had entered to the political war. Finally, the communist party had won and declared as the country as the People Republic of Laos. Since that time, Buddhism was banned for almost 20 years until the country was re-opened in 1985. All his students, led by Venerable Salee Kantasilow, vice president of Laos Sanga and chairman of meditation practice promotion unit, has restored and revived Buddhism again. He has also focused on meditation practice in continuation of his teacher, Venerable Maha Pan. Later, Buddhism is expanded its roles to involve more in social works. One of outcome is the project of Buddhism for Development is set up in 2003 which is regarded as socially Buddhism Movement for Social Work and has play an important role in society and is recognized presently.